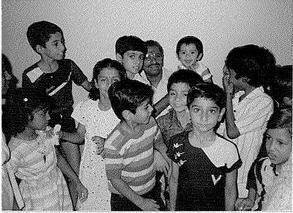 Our first house address in Baroda was 108, Vithlesh Apartment, near Jayratna building, on the first floor. We lived there till I completed my fifth standard, 1988. Our neighbour next door was a Parsi family. I was closer with Adil and Beena in that family. Both were in their high school or college. I loved their pulav. It was delicious. The parsi aunty used to put rangoli designs outside her flat every day. She was a school teacher. When we shifted to Priyadarshini Nagar, they came to visit us. Soon, they all migrated to US forever. That was the last time I saw them. We had a good relation with the Nambiar family. They were in the second floor. I was a naughty boy in my childhood. I liked their daughter’s sketch pens and sometimes used to take them by force. Later my mom would give it back. I used to do the same with Ajit, Mohandas’ madam’s son. He had some nice toys and I used to take that without his knowledge. When my mom found it out, she would return it back. I remember the day when my mom was very sick. Dad was out of station. Mom was resting on the bed in the Nambiar Aunty’s house. I had to go toilet. In those days, I was scared to close the door. So I used to keep the door open. I was shy to do the same in their house. I told Amma, I wish to go to our house. But Amma was sick. She tried to explain that I can have privacy in the aunty’s house. I was adamant. Then she took me to our house hesitatingly. 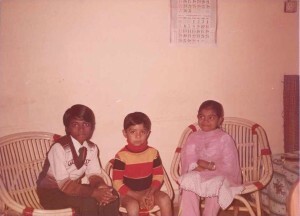 Next to the Nambiar’s house was Darshan, my best childhood friend. I think, they were the first family in the apartment to have a Television set. Everybody went to their flat to watch ASIAN GAMES – “Appu” which was hosted for the first time in India in 1982. After some time, Darshan and his parents left Baroda. When I was in 4th, they came to visit us. That was the last time I saw my best childhood friend. Later, another family occupied that flat. We had a good relation with them too. Mom used to visit their house, to see mammy. I can still see mammy’s warm smile in that wrinkled face with a big red “Bindi” on her forehead. 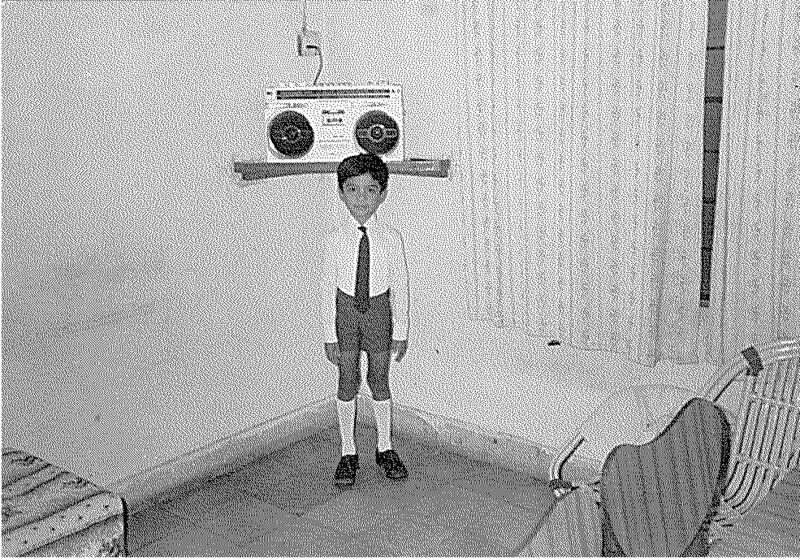 I remember the day when dad bought a BPL Stereo. I was ecstatic to see the stereo and thought it was a television set. I was six years old when my brother was born. We went Kottayam by flight during vacation since mom was carrying. I was curious to see the pilots and tried to peek inside the pilot’s cabin but no luck. I loved the food served in the flight. I took few spoons home. In those days, it was my ardent desire to become a pilot. On our return trip to Baroda, dad was not with us. We traveled alone by flight. Dad met us at the Bombay airport. It’s amazing when I think about it now, how he met us even though we didn’t have mobile phones. Vacations were very special for me. We used to go Kottayam every year. I loved the train journey. It was a 3 day, 2 nights journey. 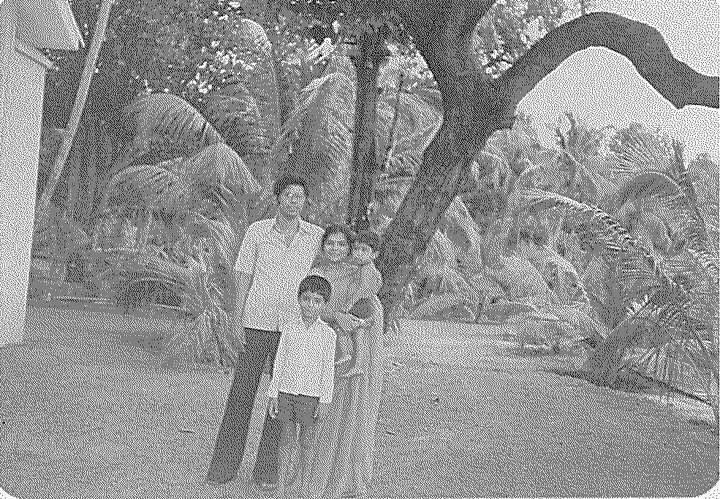 My mom’s mother, Ammachy, was healthy and energetic in those days. I remember she going after hens along with the servants, Shashi and Monnapen, to prepare delicious chicken dishes. They even used chuunda to catch river fishes. I loved watching ducks and hens. I used to pick eggs from hen’s cottage. Ammachy was always in the kitchen preparing food. Whenever I was at my dad’s place, I would be desperate to go to my mom’s place. I remember my Dad’s mother. There used to be a glass of water beside the Bible. I always used to see her reading Bible. I remember her lying on the bed in the BabyAmmachy’s house during her last days. There were tears in my eyes when she passed away. I loved going Monchayan’s house, my mom’s elder brother, since Ammay used to cook delicious roasted chicken. Simichechi, Abichachan, and I used to play Monopoly, cards, cricket, and badminton. We used to bring swimming tubes for all my cousins from Baroda. I was crazy to swim using the tube. Anish, Kochu, and I would take bath in the river during evening. It was a big headache for mom, ammachy and Binuammay when we were in the river. Mom used to carry a chool vadi when we took bath, to make sure we don’t do any mischief. Amma used to take me to “Parumela Palli” whenever we were in Kottayam during holidays. I remember the bus journey through the beautiful paddy fields. I loved the Church. There were times, I could feel the Presence of God in the Church. I was very close with my dad during my childhood. He would be in the house for a short period and was usually out of town due to company project work. When he got home, I would search his luggage to see if he got anything for me. While at home, he would teach me maths. Mom would handle other subjects and take tests. I remember an incident when I lost my tiffin box. I was scared to tell my mom about it. I told her that one of my friend, Vikram took it home to show it to his mom. After some days, she again asked about the tiffin box. I don’t remember if I was praying for some miracle, but that day I asked a caretaker in the school if she knew where I could find the lost items. To my surprise, I found it in the lost property cabin. I was very happy to see that and escaped mom’s scolding. I remember an incident when my mom tried to put notta on my fingers. In my anger, I broke the window pane with my fingers. Dad had to take me to the clinic that night. I used to receive frequent beatings from my mom for any wrong doing. I don’t think, dad ever beat me once. I remember an incident when a monkey chased me on the building terrace. I had teased the monkey and in its anger it started chasing me. I ran all the way down till the 3rd floor. But it was still chasing me. And then I fell down the steps. I couldn’t make a move and I saw that monkey sitting on that rail. By God’s grace, it did nothing and went away. I had a good friend by name, Chandu in the same floor where we lived. We used to play cards and cricket. I used to visit his house often. He was in his high school in those days. I remember Alpesh and his family, our neighbor next door. Alpesh was of my same age. We used to play cricket occasionally. Next to Alpesh’s house, was Himanshu and Dharmesh’s family. 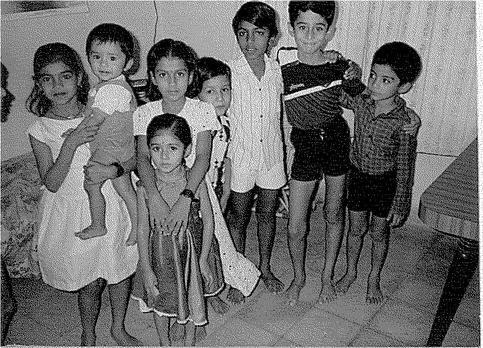 My childhood friends were Nilesh, Kunjan, Jigar, Milind, Ashish, Dolly, Vivek. I was good in playing Cricket. Every evening, we used to play cricket outside the apartment. If not outside, we used to play in the common area on the 3rd floor. It was a nuisance for neighbours. 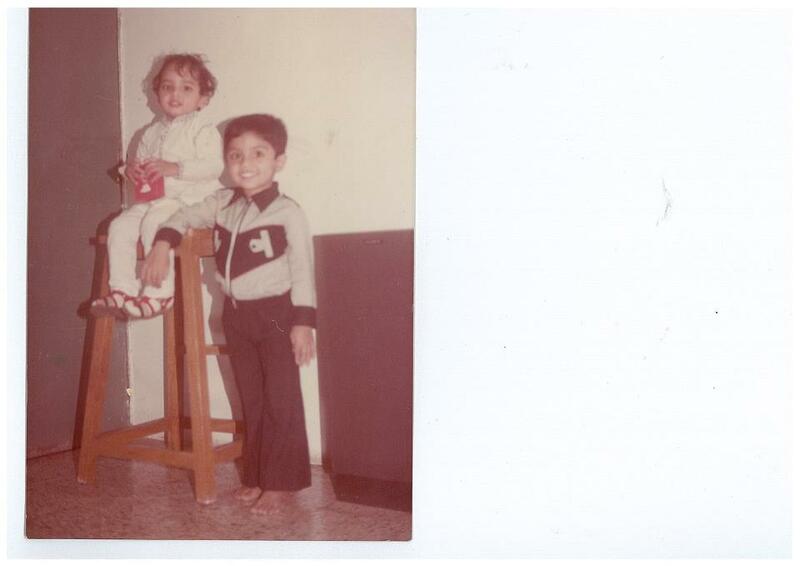 I remember Jigar’s mother, she always used to ask us to go to some other floor to play, but we used to ignore her. would come with a stick and ask us to stop the game and go some other floor. We had to stop that time. The 3rd floor was the best place to play. Once Jigar’s mom, scolded us due to the noise problem, while we were playing in afternoon. In my anger I told her, “where do we play. Every floor we go , we get the same answer..So we will play here”. She was stunned by my boldness and allowed us. Later, somebody heard my talk and complained my mom about it. After cricket, I was passionate to play “Lakhoti”. I enjoyed that game. I remember once I lost the game and I had to do “langdi” all the way from our building till the Jayratna shop and back. Occasionally, I used to rent a bicycle from Navapura. In those days, if we pay 1 rupee, we could ride for 1 hour. Once I lost my way in Navapura. By God’s grace, some nice people helped me reach my apartment. During vacation, people used to play caroms, chess, and cards. I was good in playing cards especially “charsobees”, “donkey”, “judgement”. I was glued to the television set whenever there was a cricket match. I remember players like Kapil Dev, Sunil Gavaskar, Srikanth, Navjot Singh Sidhu, Kiran More, Srinath. I used to watch all the matches when India played. We had a wonderful relation with Ashish and Dolly Family. Hailing from Kerala, we were like one family although our religions were different. They lived on the fourth floor. I loved their Onam sadhya especially the Kadla curry. During summer time, I used to sleep with them on the terrace. Many families would be sleeping on the terrace to escape the summer heat. We used to play antakshiri at night. Every time I fell sick, Kumar uncle would take me to hospital if my dad was out of station. I remember one night, I had a high fever. Kumar uncle and Sivanandan, took me to the family doctor’s house. Occasionally, both our families used to visit his clinic. He used to serve us ice-creams during our visits. We would go out together for movies, exhibitions, picnic, restaurants, wedding ceremonies or any other place. During Diwali, I used to buy crackers from shops in the Polo Ground. Both our families would go together to purchase crackers. I remember an incident, when I kept my finger near the door post of Rajni Aunty’s house, Dolly’s next door neighbor. Rekha, our house maid who was cleaning their house, closed the door unknowingly. My bones cracked, and fingers became swollen and violet color. I cried of pain. Rajdani was my favorite restaurant. I loved their chapatis and Gujarati dishes. I would be having a sumptuous meal every time I go there. I remember the trip to Ajwa Nimeta with Dolly and family. It was a common place to visit from our school. During Ganesh Chaturti, I would visit different places in the city with Dolly’s family to see Ganapati idols. 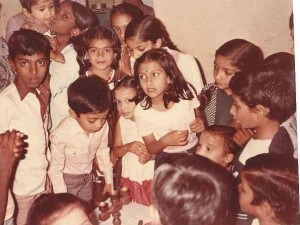 I think we used to go out daily during the ganesh festival to see the idols. Different parts of the city hosted colorful Ganapati idols, some small, some huge. People stood in the queue to have a glimpse of the idol. At certain places, they offer prasadam after viewing the idols. Uttarayan was my favorite festival with the music blasting all around. I loved flying kites. Early morning, I would be on the terrace, not only flying kites but also grabbing the ones that were cut. People would shout “Katieye”. I hated holi, which is the festival of colors in the month of March. It was as if i was allergic to the colors. But I enjoyed “Phuga Agyaras”, people throwing water filled balloon at each other. I was so naughty, that I used to put it in the freezer. It became rock solid. I gave that to Paresh and he threw it on the fourth floor. It broke the kitchen glass pane of Sivanandan’s house. For a week or so, I didn’t dare to go the fourth floor. Navratri was my favorite festival during my childhood. I would be eagerly looking forward for the event to start, sometime during night. Ladies used to wear Gagra-Choli and men in formal dresses. I remember the song “Tad Tad tali padey, tad tad tali padey”. I used to dance with the group until it got over. Amma would be sleeping at home. The last part was aarti session in front of the Hindu goddess Saraswati’s photo. 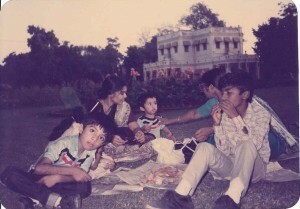 Occasionally, we used to go to some place to watch garbas with Dolly and family. During the early eighties, we didn’t have a TV. I used to watch Doordarshan movies and serials from Dolly’s house. They had a black and white television set. We would be in their house on Sundays. Their house was packed with neighbouring families during the movie time. Nilesh’s family had VCR. Since, I was his good friend, he used to invite me to watch movies at his home. I think I have watched all the Amitabh Bachan’s movies in my childhood from their home. We got our first TV, Dyanora when I was in the 4th Standard, 1986-87. I enjoyed watching serials like Malgudi days, Nukkad, Yeah joh hei zindagi, Karamchand, Hum Panch, Sigma, Vikram and Betal, Nukkad, Chitrahaar, Mungerilal, Ramayana, Mahabharat, Param Vir Chakra, Fauji. Every night, Mom would recite traditional Jacobite Church prayers. I used to read the Malayalam prayer verses in English. I didn’t understand a single sentence. During my life in the Vithlesh Apartment, I don’t remember attending the Church, perhaps occasionally. There were no churches nearby.